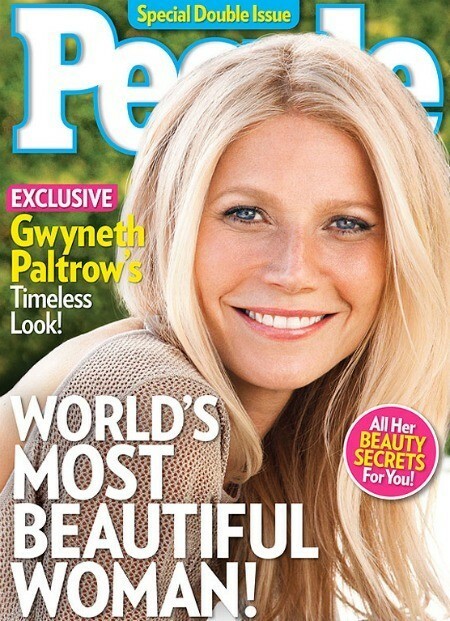 As you probably heard, Gwyneth Paltrow was named People Magazine’s Most Beautiful Woman in the World. Here’s the magazine cover. There are several reasons why I think they got it spot on with their choice: she’s a mom, she eats healthy, you never see her in the tabloids and she has a natural beauty to her. She actually seems down to earth! If you’ve ever seen an interview with her (did you see her on Ellen last week? ), she just seems like someone you would want to sit down to coffee with and chat about kids, husbands, food, fashion and just life. To achieve a beautiful, dewy complexion like Gwyneth, which also happens to be a popular makeup trend this season, I like to use a tinted moisturizer along with a few dabs of concealer along your problem areas such as dark circles or blemishes. If you’re looking for a little more coverage, apply a light-wear foundation, such as the TimeWise Luminous-Wear Liquid Foundation ($20) before you apply your concealer. When applying makeup to your cheeks, I sometimes like to skip the blush and go right for the bronzer! Apply bronzer to the apples of cheeks starting from the bottom of your cheekbones all the way up to your earlobes. I love the Mary Kay Mineral Bronzing Powder in Desert Sun ($12) Set the whole face with a translucent powder to create a wonderfully natural, sun kissed glow, similar to what Gwyneth wears so well! Gwyneth beautifully rocks a minimalistic makeup look, almost as if she has nothing on. The Mary Kay TimeWise Repair Volu-Firm Eye Renewal Cream ($40) is a great product that awakens eyes while diminishing the appearance of dark circles. Apply first before dabbing a light-coat of cream eyeshadow on the lid, such as the new Mary Kay Cream Eye Color in Metallic Taupe ($14). Complete the eye look with a light coat of brow gel and cover your lashes with a coat of the new Mary Kay Lash Love Lengthening Mascara ($15) for long, gorgeous lashes! To achieve the perfect natural-looking pout, a neutral lip shade will do the trick. For long-wearing, stay-true color, the Mary Kay Crème Lipstick in Whisper ($15) is great. For a creamier finish, try the Mary Kay True Dimensions Lipstick in Natural Beauté ($18). These shades are wonderful when looking to achieve a bold, yet natural looking lip. Don’t forget to finish the “Gwyneth look” with a makeup finishing spray, such as the Mary Kay Makeup Finishing Spray ($18) to keep your look intact for up to 16 hours! Visit the Mary Kay website to find a beauty consultant and to take a look at the products mentioned above. Previous articleFashion and Bows. Lots and Lots of Bows. Skip the chemicals and go straight for the natural! Amy Walsh shared a link. This is a shout out to all of the moms or busy women who probably had an unbeatable, Unbreathable busy weekend like me! Reward yourself or someone deserving! Each pamper me order gets a FrEE Gift! Spa paks with any other item added will receive a FREE Relaxation CD and Tea Light Candle Combo! Order and save- spread the love and share this special 48 Hour sale! Old world art with a new world twist, lets go back to the basics! All Natural Handcrafted products that help improve your skin, hair and home!